Aldhelm, bishop of Sherborne (died 709), wrote a treatise 'On Virginity' for the nuns of Barking and their abbess, Hildelith. This manuscript contains a copy of the treatise along with some other material. Aldhelm even today is notorious for his difficult writing style. This and most other manuscripts of his works have glosses or explanatory words written between the lines and in the margins. 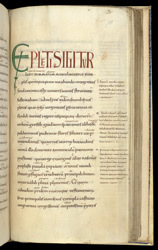 Most of the glosses in this late 10th-century manuscript are in Latin but also some were added in Old English by the first decades of the 11th century. 'Virginity' referred not only to females but males, as Aldhelm made clear in the first sentence of this section: he has explained masculine examples. The page's graphic design shows how styles of handwriting were used to signal different functions of words and letters. The section's beginning is made clear by the tall capital letters--an Anglo-Saxon version of a style originating in ancient Roman and Greek inscriptions--followed by a line in smaller capitals quoting ancient forms directly, and then the main part in the typical script for literature. The small capital letters L, M, N written between the lines refer to the corresponding letters labelling glosses in the right margin. Further glosses are written above difficult words. Most people need a lot of help reading Aldhelm's latin.